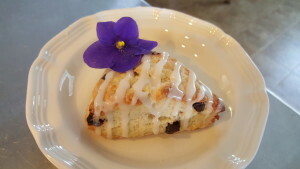 February is for lovers at the Inn and this month we are serving our Sweetheart Scones. Whether you’re here to celebrate Valentine’s Day or another special occasion you can take home a bag of our original scone mix to make these yummy scones at home. Place 1/2 tsp vanilla in measuring cup. Add enough buttermilk to equal 1/2 C. Keep chilled until ready for use. Pour contents of bag into mixing bowl. Cut in 6T chilled butter until mixture is fine and crumbly. Add chocolate chips and cherries to mixture and stir to distribute. As the scones are baking prepare your glaze. Combined 2 TB half and half or cream with 1 C powdered sugar. Then add 1/4-1/2 tsp vanilla to taste. Allow scones to cool before brushing on or drizzling glaze over the scones. What is original recipe mix? We had so many guests that loved our scones and wanted to try making them at home, but were intimidated by the complicated recipes. Easy solution – we partnered with Victorian House Scones to carry retail size bags of scone mix. The Original Mix is a proprietary recipe developed by Victorian House Scones that unfortunately we are unable to share publicly. However, here is a great basic recipe for the dry ingredients. Mix together, and pick up the recipe where you cut in the butter and you should be fine. Thank you for your question and let us know if you need further assistance.